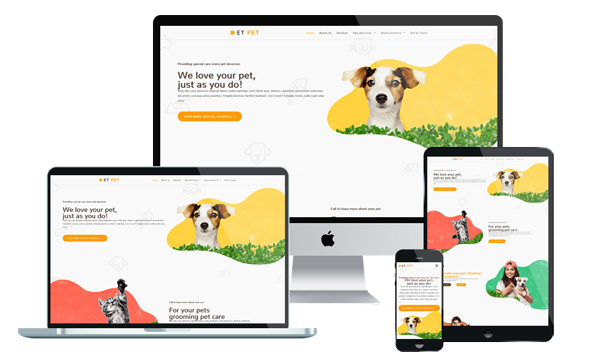 ET Pet is a lovely Animal Joomla template which will be suitable for any pet care, pet shop, or animal rescue centers, as well as animal hospitals. This amazing template for animal has been well-developed on the latest web technologies including Bootstrap, unlimited module position, strong shortcodes helping you present content easily, 4 color styles build-in HTML5 and CSS3, but really easy to customize. Besides, drag-drop tools and color settings also come with the template so you have no difficulty to create a beautiful website with attractive view and various layouts. With ET Pet Clinic, you can show to everyone show your love with pets and how perfect is your services/products with its eye-catching content organization. Especially, this template appears beautifully on any mobile devices, with the same excellent quality on desktop, therefore, all contents on your site will be shown flawlessly in the eyes of customers. Don’t miss this awesome design, grab it now!